For more information on Eye Care, please click on the button below. 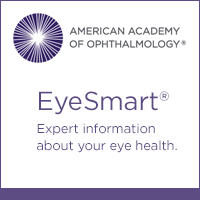 Send your questions or comments about EyeSmart to eyesmart@aao.org. 1. What is a retina? It is a nerve layer that lines the back of your eye and “takes pictures” and send images to your brain. 3. What causes diabetic retinopathy? High blood sugar which damages the tiny blood vessels of the retina. High blood pressure can cause more damage to the weakened vessels in your eye, clouding more of your vision. Diabetes damages small blood vessels throughout the body, leading to reduced blood flow. 4. What are the symptoms and complications of diabetic retinopathy? Most of the time, there are no symptoms until there is a change in your vision. Once that happens, you may see floaters in your vision, have pain in the eye, blurred or distorted vision or difficulty reading and/or partial or total loss of vision or a shadow or veil across your field of vision. 5. What increases your risk of diabetic retinopathy? Developing diabetic retinopathy depends largely on 2 factors:1)How long you have had diabetes? 2)Whether or not you have kept good control of your blood sugar. 6. What are some risk factors you can control? Consistently having high blood sugar. Keeping sugar levels in a target range can reduce your risk and can slow the progression of the disease. Long-term studies of high blood pressure show that retinopathy is more likely to progress to the severe form and to macular edema if high blood pressure is not controlled. 7. How is diabetic retinopathy diagnosed and what is recommended for early detection? Diabetic retinopathy is detected during an exam by an ophthalmologist or optometrist. Early detection and treatment can help prevent vision loss. The American Diabetes Assn recommends:Type 1 Diabetics, 10yrs and older, have an eye exam within 3 to 5 years after diabetes is diagnosed and then every year; Type 1 or Type 2 Diabetics who become pregnant should have an exam before becoming pregnant, if possible, and then once during the first trimester. 8. What are lifestyle changes that can help reduce your chance of vision loss from diabetic retinopathy? Healthy diet which will help control high blood sugar levels, lower blood pressure, and reduce high cholesterol. Don’t smoke. Avoid hazardous activities. Get adequate exercise.